For some time now we have had Gardeners’ World cloche envy. I have some home made cloches made from some old bases used on an exhibition stand and then rescued from a skip about 10 years ago. They are (were), to say the least, ropey. 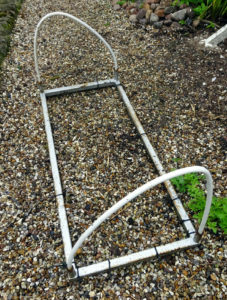 They were rusty, the hoops were made from plastic pipe, which had deteriorated, and they were covered in torn netting. With spring finally approaching and Monty Don’s cloches in full view on Gardeners’ World, the time had come to update ours. I started by cleaning them back to rust free metal. Then I welded in 10mm steel hoops for stability. Finally some old corrugated sheeting, saved from a skip having served its purpose as a friend’s ‘lean-to’ roof, was cut to slot inside the hoops. The end panels were then made from some offcut plastic sheeting used in picture framing. 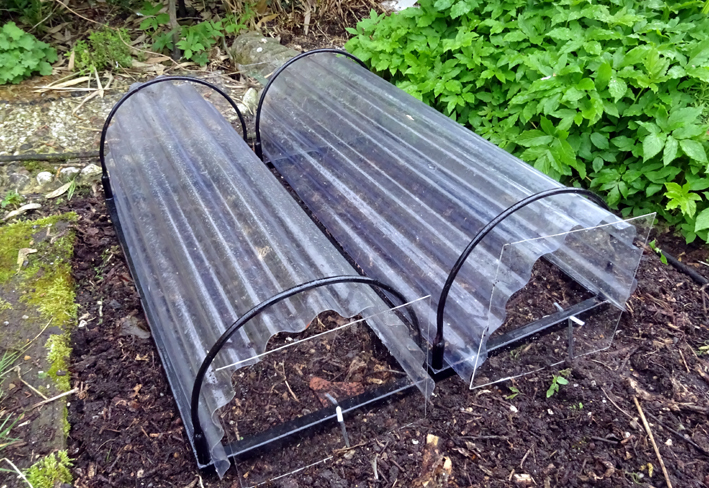 The plastic can then be slid out and replaced with netting for summer protection of brasicas. A coat of rust protecting undercoat and black paint and we are no longer quite so envious. Cost about £2 for the metal used in the hoops and £3 of paint, the rest recycled, result.